EllieRaine: I think it's Summer! As you've probably heard if you don't live in the UK, we've had the hottest summer on record since 2006. Although I don't remember it being that hot then either. I think it's safe to say that summer finally arrived here. We've had a couple of days of on and off thunderstorms, but thankfully it has cleared the humidity and we can all breathe a bit easier. My garden has certainly loved it, and it's been lovely to see so many gorgeous butterflies, birds and bees enjoying our blooming plants. As for the creation side of things. It's been a tad too hot to settle into something wooly & heavy so I treated myself to this lovely pattern from Little Cotton Rabbits. I've admired these rabbits for quite a while and when Julie decided to share the pattern to the general public I hopped over to Ravelry (pardon the pun) and bought it. I also bought the boy bunny pattern too. 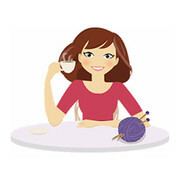 Here is my Ravelry Project Page which lists the wool I've used. My eldest daughter wants one too, so I've already cast on. 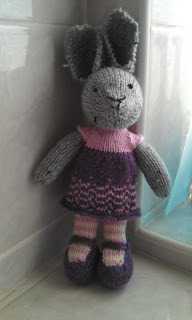 This time with a different coloured yarn for the body, shoes & dress. If any of you would like to make your own little rabbit. Here are the links to the patterns & website. I can't wait until Julie releases the patterns for her other animals!